Today we celebrate a great feast of the Church that speaks directly to the spiritual challenges that we all face on a daily basis, both as particular people and as members of this parish community. For today we celebrate the presentation of the infant Jesus Christ, forty days after His birth, in the temple. The Theotokos and St. Joseph bring the young Savior there in compliance with the Old Testament law, making the offering of a poor family that could not afford a lamb, a pair of turtle doves or two young pigeons. 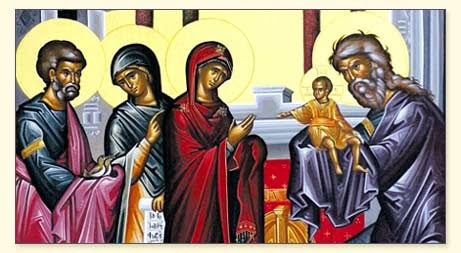 By the inspiration of the Holy Spirit, the old man St. Simeon proclaims that this Child is the salvation “of all peoples, a light to enlighten the Gentiles and the glory of Thy people Israel.” The aged prophetess St. Anna also recognizes Him as the fulfillment of God’s promises. Our epistle reading from Hebrews reminds us that the One brought into the temple that day is the Great High Priest Who offers Himself, Who becomes the Passover Lamb through Whom sin and death are destroyed so that we also may enter into the Heavenly Temple, into the very life of God. In ways that our minds cannot fully understand, Christ’s offering and priesthood are eternal, as He now intercedes for us at the right hand of the Father. He fulfills all the foreshadowing of the Old Testament to bring us through Him into the true Temple, the eternal Sanctuary of the Kingdom of Heaven. Every day of our lives, in all that we say and do, we have the opportunity to join ourselves more deeply to Christ, to become more fully “partakers of the divine nature” whose lives are constant offerings to the Lord. He created us and all that is, and His salvation is the fulfillment of the entire universe. All that we must leave behind is our corruption, our sin and its sickening effects. Even as the person with a broken bone wants to get past the resulting pain and disability in order to regain health and strength, we want to do the same thing in every dimension of lives. The focus is not on legal judgment, but on the healing of our distorted, weakened selves and world. A very important aspect of this healing that we have not talked about a great deal in our parish is the strength that we find through participation in the full liturgical life of the Church. By that I do not mean coming to the Divine Liturgy on Sunday and major feast days whenever possible, which is a fundamental practice of the Orthodox Christian life. At least for Sunday liturgy, we do that fairly well here at St. Luke. Instead, I want to draw your attention this morning to the two other services that we celebrate virtually every weekend, Great Vespers on Saturday evening and Matins on Sunday morning. These services, along with others, are conducted daily in monasteries, but most parishes understandably serve them only on Saturday night and Sunday morning. We do so because of the great glory and dignity of Sunday as the day of resurrection, the day in which we celebrate Christ’s resurrection. His High Priesthood shines forth in the Divine Liturgy of every Sunday, for it is through Him that we enter into the Heavenly Banquet, into the joy of the true Temple of the Kingdom of Heaven. And when we receive Communion, we are united with God in the most profound and intimate way possible. His Body and Blood truly become our own. As we all know, deliberate preparation is in order each time that we receive the Eucharist. We must say the prayers of preparation; we must fast from food and drink; and we must take Confession on a regular basis and especially when we have a guilty conscience or are aware of having committed grave sin. None of us should ever take Communion for granted or fail to prepare ourselves as best we can. Whenever you have questions about anything related to taking Communion, just let me know. Participation in Great Vespers is also very helpful preparation for the Sunday Divine Liturgy. It is actually the first service of Sunday, for in biblical times the day began with sundown the night before. Vespers is much simpler and less ornate than the Divine Liturgy, as it consists of prayers, hymns, readings and Psalms that recall our creation, our fall, and the shining of the “Gladsome Light” Jesus Christ Who rose victorious from the tomb. Portions of the service focus on the distinctive themes of that particular Sunday and prepare us to meditate upon them in preparation for Liturgy. Sometimes there are Old Testament readings, and the service usually lasts about an hour. “Orthros” means “early dawn” and we pray at that time on Sundays because that is when the women went to the tomb of Christ and received the good news of His resurrection. “Matins” means “morning” and is simply another name for the service. On most Sundays, the service focuses on the resurrection. Each week, the priest reads one of eleven accounts from the gospels of Christ’s appearances after His resurrection. The chanters sing one of the eight resurrection troparia and there are various other readings and chants that relate to the saints being commemorated and the season of the church year. We move from orthros into liturgy with the Great Doxology that begins “Glory to Thee, Who has shown us the light.” That’s when we turn up the lights and open the royal doors, for we are now entering through our Great High Priest into the great glory of the liturgy of the Kingdom of Heaven. The One who was taken to the temple as a baby now takes us into the true Temple, into heavenly worship of the Holy Trinity as He nourishes us with His Body and Blood. If something is important to us, we prepare for it. The more we put into something, the more we get out of it. Attending vespers and matins prepares us to share in the great blessing of the Divine Liturgy and especially of receiving Communion. It will also strengthen our parish as a community, for at the very heart of the life of the Church is our worship, which is not limited to an hour and half on Sunday mornings. We do not have as many services as larger parishes with a full-time priest and more chanters and servers, but we do what we can. As your priest, I ask you to do what you can to strengthen your spiritual life and our collective entrance into the Heavenly Temple by coming to vespers and orthros whenever that is possible for you. You will find it to be a blessing in your life and not a major inconvenience. Of course, some have health problems, transportation issues, and work schedules that make it impossible for them to do so with regularity; if so, pray at home. Most of us, however, could attend either service at least once a month. Rest assured that this is not some kind legal requirement and no one is taking roll; instead, it is an invitation to join ourselves as fully as we can to Jesus Christ, our Great High Priest Who wants us to share with Him in the joy of the Heavenly Temple. Sts. Simeon and Anna were prepared by years of prayer and fasting to meet Him in the Jerusalem temple, and now He makes it possible for us to meet Him in the Temple of Heaven, and even to dine at His table. There is no question that we all need to prepare for that, for we want the eyes of our hearts to be as open as possible to the “light to enlighten the Gentiles and the glory of Thy people Israel,” our Lord, God, and Savior Jesus Christ, to Whom be glory and honor, together with His Un-originate Father and the All-Holy, Good, and Life-Giving Spirit, always, now and ever, and unto ages of ages.